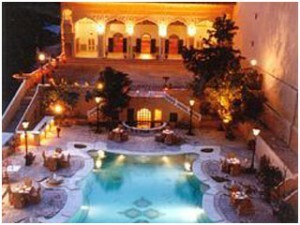 A perfect example of Rajput/Mughal architecture, this hotel is owned and operated by a noble family. 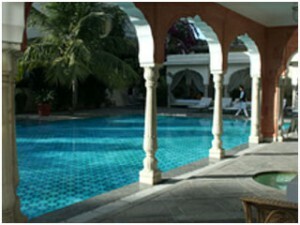 It was originally the private residence of the Samode royal family but converted to a hotel in 1985. The atmosphere is a balance between luxury and home comforts. While the fabrics might be a little faded, there are family portraits and Uncles on tiger hunts, on display everywhere and who knows if his highness himself might greet guests for dinner or even help them to their room. Behind the city’s fortified walls, you’ll find this former royal residence. It feels like a mix of a museum, stately mansion and adult playground, featuring restaurants, a spa, cinema, pool, gardens, courtyards and stunning decor. The choice of food is extensive, and one must have tea on the lawn here. There aren’t many accommodations within the walled city, but this one of them. It’s a 200-year old mansion with amazing authenticity, and the rooms are furnished with Rajasthani antiques and amazing architecture, including marble floors, colored-glass windows, arches, and deep alcoves for relaxing. Besides the bright and spacious rooms, the best thing here is the amazing pool, which provides a perfect place to unwind after a day of exploring. 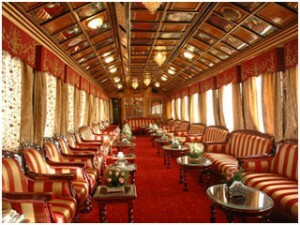 If you are a romantic or a train buff, then you may love to see Rajasthan from the Palace on Wheels. It has 14 cars, housing two restaurants and 52 wood-paneled compartments with double beds, each with private bath and shower. The eight-day all-inclusive journey begins in New Delhi and stops at all of the major sites in Rajasthan, as well as at the Taj Mahal. One of the downsides is that you’ll have to keep to a tight schedule. 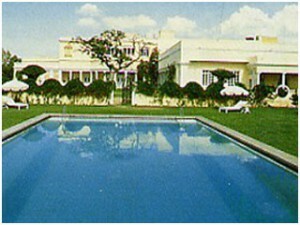 This art Deco Palace was one of the Rajmata’s (Queen’s) main homes and is now a Taj Hotel. From the moment you drive up to the main entrance you’ll be treated as royalty. The service here is probably the best in Jaipur, which you’ll see as a turbaned doorman escorts you up the stairs and shields you from the sun with an tasseled parasol. 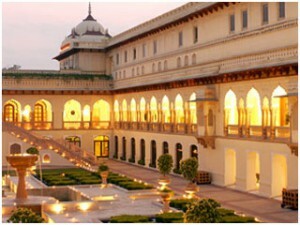 The palace is 172 years old and the first to be converted into a hotel. The rooms are large, and the public areas are grand. Check out the massive green lawn and have an afternoon cocktail at the Polo Bar.